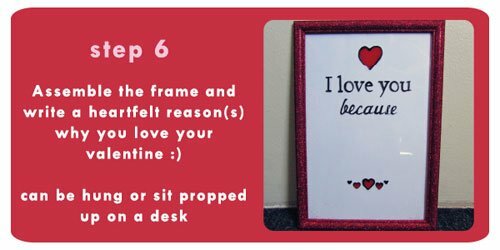 Remove backing and glass from frame and set aside. Using the paintbrush, coat one side of the frame in construction glue and sprinkle red glitter onto the glue. Dust of surplus glitter. 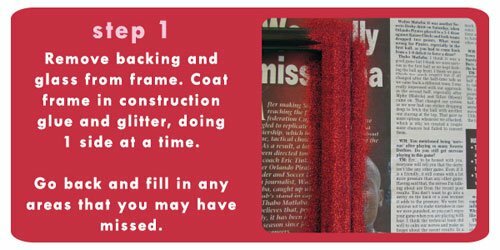 Continue the above steps until all four sides of the frame are covered in glitter. 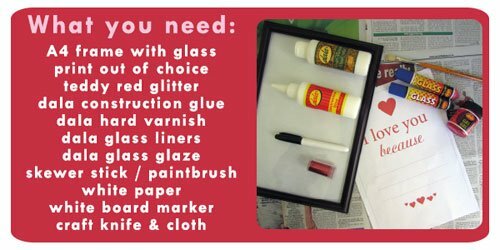 Take care to go and fill in any areas that may have not been sufficiently glued or glittered. Set the frame aside to dry. 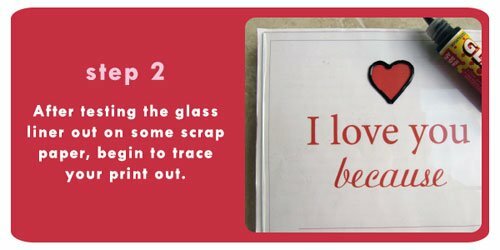 TIP: On a scrap piece of paper - test the glass liner to get used to how it works. Much like with an illustration pen, you can control the thickness or thinness of a line just by adjusting your pressure. Squeeze the glass liner gently when you need a thin line, and firmly when you need a thick line. Play with this for a while until you are comfortable enough to begin. 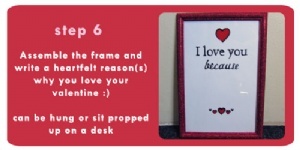 Print out the supplied template or create your own by hand or also printed out. You will be using this to trace onto the glass. Clean the sheet of glass thoroughly - being careful when handling the edges for the glass is very sharp and can cut you. 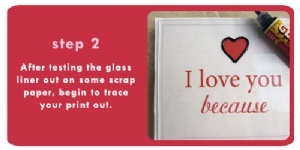 Place the glass on top of the print out, taking care to line it up so that it is straight etc. 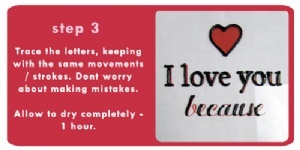 Trace the letters and heart shapes of the print out / your own design keeping the above in mind. I did all of the thick lines first and then went and filled in the thinner lines. Don't worry if you make a few errors as we will go back and edit them later in the tutorial. Complete the outline tracing and leave the black glass liner paint to dry for an hour (especially if thickly applied). This must be completely dry before moving onto the next step. 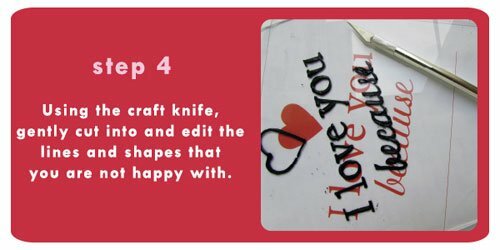 Making sure the black glass liner you can make use of the craft knife to edit any lines you may not like, or to cut and scrape away any bumps etc that you may not be happy with. Wipe the glass to rid the surface of all the scrapings and bits you have cut off. With the outlines finalised, you can fill in any colours your design incorporates with Dala Glass Glaze. Using the skewer stick or the paintbrush, dip into the Glass Glaze and drop the colour onto the glass within the area you would like to colour. 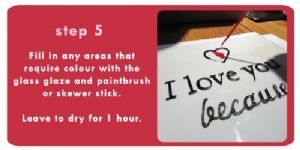 Help the paint to spread out by pushing it around a bit, adding more colour when it becomes a bit thin. The entire area should be covered in a thin, but even and solid colour. Making sure that the glass glaze is completely dry, assemble the frame by placing a sheet of pain white paper between the glass and the back piece. This with the glass creates the whiteboard effect. Now all that's left to do is write a heartfelt reason why you love your Valentine. This item has 746 views.